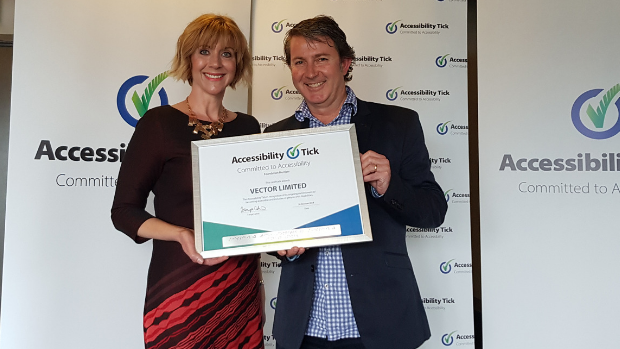 At the Inclusive NZ Conference in Wellington yesterday, Vector was recognised for its role in co-designing the Accessibility Tick programme. Vector’s Chief Risk Officer, Kate Beddoe, says: “Diverse, inclusive, and accessible workplaces are win-win situations: employees feel valued and accommodated, which boosts productivity, raises morale, and results in a more successful business. Making our workplace even more welcoming will benefit these employees and means we can also tap into a talented pool of prospective employees. Accessibility Tick programme lead, Tanya Colvin, applauds Vector for its commitment to accessibility, and for its willingness to get involved at an early stage to co-design a programme that will resonate with the business community. She explains that while there has been great appetite from New Zealand employers to be inclusive of people with disabilities for some time, the missing piece for many has been the ‘how’. “We know employers see the value in fostering a diverse and inclusive workplace. We have seen them tackle inequities in areas such as gender and demonstrate their commitment to the LGBTTI community through the Rainbow Tick. “Meanwhile the roadmap to accessibility has not been all that clear, so we are pleased to be helping employers take it out of the ‘too hard’ basket with the Accessibility Tick programme. 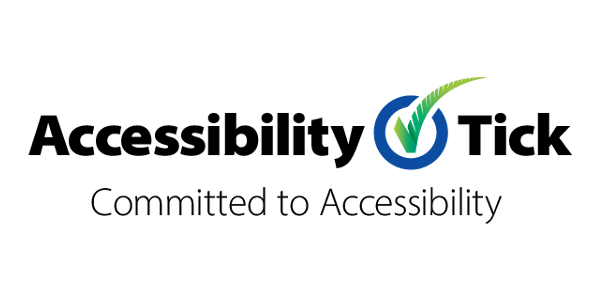 The Tick provides them with the structure, tools and support to implement an action plan where they are committed to taking meaningful steps towards accessibility and inclusion through policy, culture and environmental changes,” says Ms. Colvin. The Blind Foundation is a lead partner in the Accessibility Tick programme, which has grown from the organisation’s insight that a pan-disability initiative was needed to create systemic change supporting employment of people with disabilities. Blind Foundation spokesperson Norman Evans says the organisation supports clients through its employment support service and while that has fostered many individual success stories, it is only a drop in the ocean in creating meaningful change for employment of people with disabilities. “New Zealanders with disabilities are three times less likely to be employed than their non-disabled peers. Over more than 15 years, we haven’t moved the dial significantly in bridging that gap. “The Accessibility Tick programme turns the traditional approach on its head, highlighting that the problem isn’t about people with disabilities – it’s about how workplaces are setup to include them,” says Mr Evans. Some of the easily achievable steps Vector has taken to encourage a more accessible workplace include: integrating accessibility into their Health and Safety protocols; senior managers attending unconscious bias training; and changes to their recruitment processes and the way vacancies are advertised to encourage those with disabilities to consider Vector as a workplace. Ms. Colvin says both employers, and potential employees benefit from the Accessibility Tick: “It serves as a mark of confidence for all parties that inclusivity and the needs of people with disabilities are not just taken seriously – they are welcomed. The Accessibility Tick programme is currently working with a further nine organisations. These employers are expected to become foundation members when they are awarded with the Accessibility Tick. Supplied photo: Tanya Colvin, Accessibility Tick programme lead, with Paul McCloskey, Vector’s Group Manager – HR, holding Vector’s Accessibility Tick award. The Accessibility Tick programme helps New Zealand organisations become more accessible and inclusive of people with disabilities. We are a pan-disability social enterprise with a vision for bridging the accessibility and disability employment gaps. We recognise that New Zealand organisations have a variety of accessibility issues and we help to simplify that process and to get better outcomes. Vector is New Zealand’s largest distributor of electricity and gas, owning and operating networks which span the Auckland region. We’re leading the transformation of the energy sector to create a new energy future with sustainable energy technology, which includes solar power, energy storage, EV charging stations, and smart meters, and we’re constantly identifying and developing options that will provide value, choice and service for our customers.